Three-star prospect by Rivals, 247Sports and ESPN … Ranked as the No. 35 running back in the nation and 18th overall player in the state of Alabama by Rivals … Rushed for 1,363 yards on 183 carries, scoring 19 touchdowns in 2018, while also hauling in 13 passes for 166 yards … Averaged 7.5 yards per rush and 94.9 yards per game … Opelika-Auburn News Offensive Player of the Year … Led Central High School to a 10-0 regular season record and a spotless 4-0 mark en route to the Class 7A Alabama High School title after a 52-7 win in the championship game on Dec. 5 … Racked up 156 yards rushing in the opening round of the playoffs on Nov. 9, with 126 coming in the first half of the 46-0 rout of Davidson … Accounted for 118 total yards in the state title matchup, rushing for 78 yards on 14 carries and a touchdown while catching two passes for 40 yards … Participated in the 2018 Alabama vs. Mississippi All-Star Game on Dec. 17 … Totaled 944 yards and 14 touchdowns on 74 carries as a junior for the Red Devils in 2017, helping Central to an 11-1 mark and a semifinal berth in the 2017 Alabama state Class 7A tournament … CHOSE ARKANSAS OVER: LSU, Ole Miss, Missouri, Cincinnati, Purdue and others. 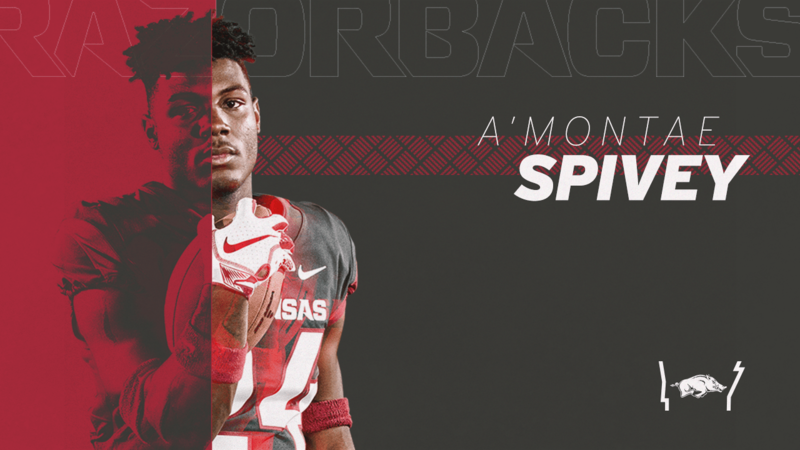 A’Montae Spivey … Born Aug. 28, 2000 … Son of Teisha Floyd and Carlton Spivey.